Two, probably monotypic, genera are present in the Bolitaenidae. These are common meso- to bathypelagic octopods of rather small size (ca. 85 mm ML in the largest species) that are broadly distributed mostly in tropical to temperate latitudes of all oceans. They have gelatinous bodies, numerous chromatophores and possess short arms with a single series of suckers. The mantle aperture is wide. The hectocotylus has a swollen ligula in Bolitaena but is unknown in Japetella. Arms short; length less than ML. Suckers in a single series. Third right arm in Bolitaena hectocotylized (Japetella apparently lacks hectocotylization although some sexual dimorphism of arms III occurs). Long axis of digestive gland parallels body axis. Stomach posterior to digestive gland. Radula with multicuspid lateral teeth (= ctenoglossan radula). Figure. Radula of Bolitaena pygmaea, redrawn from Thore, 1949. Mature females with a circular light organ surrounding the mouth. For immature octopods, the two genera can be difficult to separate. The most obvious features are the size of the eyes (larger in Japetella) and the distance between the eyes (larger in Bolitaena). 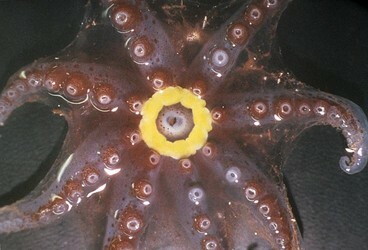 When comparing adjacent octopods (see below), these differences are distinct. However, with isolated specimens, the differences are not always obvious. Figure. Left - Dorsal view of Japetella diaphana, 83 mm ML, nearly mature female. Right - Dorsal view of Bolitaena pygmaea, 38 mm ML, immature female. Differences above in arm sizes and pigmentation is accuated by the size disparity. In addition, if the J. diaphana were smaller, the separation of its eyes would be less. Bolitaena microcotyla Steenstrup in Hoyle, 1886, has many similarities to Eledonella pygmaea. Thore (1949), in his review of the family, distinguishes B.microcotyla primarily by its having (1) large eggs, (2) suckers apart within the web and closely set beyond the web and (3) reddish-purple color. The eggs of B. microcotyla are 2.5 mm in length (Thore, 1949). The eggs of "E. pygmaea" (incorrectly identified by Young, 1972, as Bolitaena microcotyla), however, are nearly the same length (2.0 mm, Young, 1972). The second and third distinguishing characters result from rather marked morphological changes that bolitaenids exhibit at sexual maturity. At maturity females lose the irridescence on their eyes and digestive glands, become heavily pigmented (the degree of pigmentation is greater in Bolitaena), and the arms increase in length relative to the mantle length. The longer arms produce the distinctive sucker arrangement on the arms (Note the pigmentation and sucker spacing in the photograph of the brooding female below). Unfortunately, adequate material has not been available to quantitatively document these changes. Nevertheless, the mature female appears very different from the subadult and has resulted in labeling different life-history stages as different genera. The genus Bolitaena was described nearly 30 years before a species name, B. microcotyla, was appended in 1886, in a brief description. Description of a new genus without a type species is no longer legal under the rules of zoological nomenclature but was valid at the time. Eledonella pygmaea was described by Verrill in 1884. The proper name, therefore, is Bolitaena pygmaea (Verrill, 1884). Careful comparisons of specimens in good condition (or, more likely genetic analyses) may eventually reveal that more than one species of Bolitaena exists. Our present knowledge, however, requires synonymizing the genera and leaves little reason for maintaining separate species. Thore (1949) described Dorsopsis taningi as a new genus and species of bolitaenid that had hemispherical, dorsally directed eyes. This specimen, however, was a damanged Japetella (Hochberg, et al., 1992). A list of all nominal genera and species in the Bolitaeninae can be found here. The list includes the current status and type species of all genera, and the current status, type repository and type locality of all species and all pertinent references. A large light organ develops around the mouth in females at maturity. Presumably it functions in attracting a male in dark waters at a depth of 1000m or more (Robison and Young, 1981). This is the only luminescent organ known in incirrate octopods. Figure. Oral view of mature female Japetella diaphana showing yellow photophore around mouth, off Hawaii. Photograph by M. Vecchione. 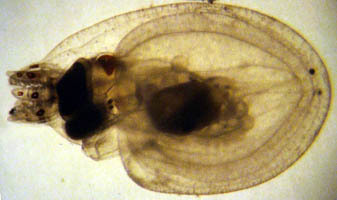 Bolitaenids brood their embryos until hatching. During brooding, the eggs are held by suckers near the mouth where they are well covered by the arms and web. Figure. Arms of Bolitaena pygmaea holding onto a brood of embryos. Arrow in photograph points to a sucker holding one of the eggs. Photograph by R. Young. The chorion of each egg has a long stalk that attaches to the chorion of an adjacent egg. Some eggs will have several stalks attached to them. As a result the egg cluster is a matrix of eggs attached to one another in a rather haphazard way. Figure. 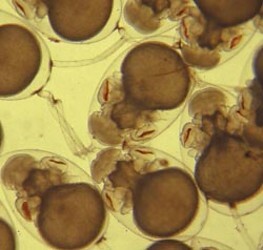 Developing embryos of Bolitaena pygmaea or Japetella diaphana. 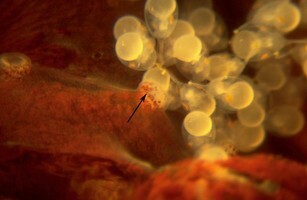 The egg in the upper left corner of the photograph has two stalks attached to the chorion opposite the large yolk sac; the lower of these two stalks has a third stalk attached to it (note the pigmentation that marks the attachment). Photograph by R. Young. Off Hawaii female bolitaenids apparently release their young at a depth near 800m. The young, free-swimming octopods are found at depths around 150 - 250 m. As they grow they descend, at first abruptly then more gradually, to depths of 800 -1400 m. Gravid females are found at the lower end of the range where mating presumably occurs (Young, 1978). More details of this pattern are presented under each genus. Figure. Ventrolateral view of a hatchling of Japetella diaphana. This hatchling may have hatched slightly prematurely due to the trauma of capture). Note that only a few chromatophores are present and that the arms are very short. Photograph by R. Young. Page: Tree of Life Bolitaeninae Chun, 1911. Authored by Richard E. Young. The TEXT of this page is licensed under the Creative Commons Attribution-NonCommercial License - Version 3.0. Note that images and other media featured on this page are each governed by their own license, and they may or may not be available for reuse. Click on an image or a media link to access the media data window, which provides the relevant licensing information. For the general terms and conditions of ToL material reuse and redistribution, please see the Tree of Life Copyright Policies.